Plot: Boris is an ex-convict who just happens to get out of prison. He meets up with his reluctant ex-girlfriend. Boris wants to commit one more heist. Wendy’s rich, millionaire boss. He gets her to go along with the plan. She sneaks him in to the rice man’s castle. There as they go about their plan. In the basement, they don’t know that the millionaire boss is aware of their doings, soon the trap is set and they become locked up, trapped. Soon they must adventure farther and farther into the basement corridors. One door after another leading into a path of puzzels. Each door has a game. Each door has a path. Each door leads to a new destination of terror or there ultimate freedom. This is being brought out on a lovely DVD by an awesome company that brings out forgotten cinema, or cinema that never gets the lime light, or push that it deserves. InterVision is a wonderful company that gives the lover of Drive-in, B-movie, low budget, underground Cult cinema an outlet. 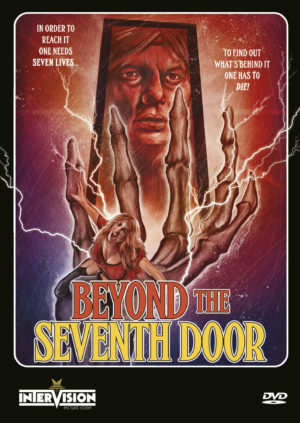 This Beyond the Seventh Door DVD is perfect. A Drive-in Cult obsession with being able to experience this film on a high-quality DVD. A forgotten little horror gem makes its way to DVD through InterVision, a side company of Severin-Films. This awesome lost Drive-In flick is a perfect example of a good Drive-In style film. A perfect mystery suspense popcorn flick. Starring Lazer Rockwood. Rockwood is still acting today. A character actor and sideline player in many lower budget cinema pieces. Many comic book fans or Sci-fi Fantasy fans will remember him as the character of Lazar in the TV movie and TV series Witchblade. Also starring Bonnie Beck who has not acted since 1996. She left a vast array of lower budget cinema, mainly horror from 1986’s City in Panic, to 1987’s Don’t Turn Out the Light. This is the only film Gary Freedman ever acted in. Ben Kerr only starred in a documentary after Beyond the Seventh Door. Beyond the Seventh Door was a lost and obscure film. I had never even heard of it until I saw the announcement that InterVision would be releasing it. So, this was a new wonderful experience of Drive-In B-movie nature that shined with complete perfection for this B-movie lover. This now resurrected feature thanks to InterVision has become a new favorite of cheesy goodness. This lost and obscure feature is an awesome, strange mystery flick, that I found myself absolutely loving or at least laughing act through it’s over the top cheesy entertainment. Directed by Bozidar D. Benedikt. He only directed two other films after Beyond the Seventh Door. One being in 1991, the horror film known as The Graveyard Story, I had seen this film by him. Another B-grade flick that makes itself known. I feel Beyond the Seventh Door is his prime example of Cult status of the B-movie, late night, Drive-In flare that shines for lovers of this type of films. InterVision has done an amazing job in finding this forgotten Drive-In gem. Bringing it out on a wonderful DVD and giving it a second chance at life. The audio is spot on. A perfected ear candy for the listener. The video looks good. The picture quality maintains a better reality then most films lost by time. The imagery is vibrant in color. Then you get a program called The King of Cayenne. Which is an appreciation of Legendary Toronto Eccentric Ben Kerr who stars in the film as the dead body. You also get an option of Audio Commentary with director, actor Lazar and Paul Corupe. This is a wild over the top little B-flick of horrible acting, dialogue, but that’s the ultimate beauty. It’s a wonderment of cheesy dripping nachos, the ooey gooey glory of low budget simplicity. It’s a laugh out good time. A perfect DVD of low budget glory that only InterVision could bring out.